Of Gods And Men was one of the regrettable no-shows at last year’s Inverness Film Festival. Here it is now though, and it was worth the wait. Telling the story of a group of French monks in Algeria who were found dead in 1996 having stayed in the country during the Algerian revolution despite being advised not to, the film deals in a softly-spoken, slow-handed manner with the question of what motivated them to stay and face death. It is not a complex film structurally but it is a deep one. It moves with the careful lack of haste of an archaeological dig and gradually allows some insight into what may have motivated the monks, what their experiences of religious calling might have been, and what generally constitutes the practice and purpose of prayer. Most enthrallingly, from my point of view, the film through its precisely delineated characters gets to grips with the question of what men of retreat and non-violence should do when conflict presents itself. “The serenity to accept the things that can’t be changed, courage to change the things that can, and wisdom to know the difference” in the comforting but confusing words of twentieth century theologian Reinhold Niebuhr. Director Xavier Beauvois is not, I think, concerned with answering any moral, ethical or religious questions absolutely, but he clearly enjoys exploring the experience of individuals. This where my interests lie too. I was brought up in a religion from which I moved away a long time ago. There were compelling reasons for me not to belong to a specific religious faith, but the matter of (for want of a better word) spirituality has become extremely interesting to me in recent years. It seems to be such a common experience in people, this nebulous, unquantifiable, undetectable, spooky interaction with the supernatural. I hear people talking all the time about their relationship with God, or Allah, or their Higher Power, or the guiding angel light of their recently-departed Aunty Bunty, but it doesn’t coincide with anything I’ve ever felt or experienced. This not, I hope, simple posturing on my part. I don’t particularly like the bit in Star Wars where Han Solo slouches insouciantly on the Millennium Falcon’s DFS sofa and quips dully about having flown from one side of the galaxy to the other and never seeing anything to make him believe in the force. This seems particularly disingenuous as a mere twenty years previously the Jedi were poncing all over the shop using the Force, but I digress. I like to take people at their word. I like to assume for the most part that when people tell you about their own experiences they are doing just that and not forcing an agenda. My problem is that other people’s experience of God seems to be different from mine. When they use words like “spiritual” or “supernatural” I don’t know what they mean. I’m not a solipsist. I work on the principle that the universe exists, and that it’s the same objective universe for all of us. I think our subjective experiences of it differ, but I’ll never know that for sure. What I’m happy about is that when we all say, “Look, there’s a sorbet or an armadillo or a fleet of Austin Allegros” and we lick it or chase it or drive it towards one another we are sharing an experience. But I don’t get this notion that we can somehow interact with something that cannot be detected. When I pray, or meditate, or zone out I am aware afterwards that my conscious mind has been absent, or at least stilled to the point where it’s not filling my head, but I don’t feel that I have communed with something ineffable. There’s a lot of unconscious brain activity that goes on in my noggin, and it is good at what it does. It keeps me alive. Bloody hell, where would we be without our autonomic functions? I trust my medulla oblongata to steer me right. It’s a long way from a burning bush though. When people tell me about their direct experiences of God I believe them, but I haven’t had one myself. I feel very much like a blind person having Magic Eye pictures explained to him. I nod a lot. I don’t really understand the phenomenon. Of Gods And Men is scrupulous in its depiction of the monks as good people. It even-handedly portrays their local Islamic community as good people too, and celebrates the similarities of the Abrahamic religions. The antagonising force in the Algerian revolution, the Jama’ah al-Islamiyah, is shown to be violent and political, temporally driven rather than spiritually so. It’s not a proselytising film though. There is room in it for the exploration of doubt and loss of faith, and I was grateful for that. I often feel that of all the apostles Thomas gets the hardest time. His reaction always seemed to me to be the sensible one. This is absolutely worth your time and subsequent consideration. The acting highlight (and the cast are all utterly persuasive) for me was Michael Lonsdale’s performance as Brother Luc. Day Of The Jackal and Moonraker are now but dim memories. 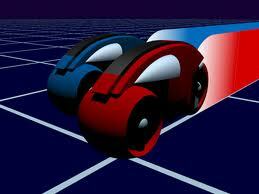 When the original film Tron came out in 1982 it was widely sniggered at. It didn’t look anything like its contemporaries thanks to its weird, processed neon-stripe livery and pioneering use of wireframe computer graphics. Nor did it sound like anything else out at the time thanks to its spiky score by Wendy Carlos (formerly Walter Carlos, if you want more details Google it). Carlos’s previous gigs had included A Clockwork Orange and The Shining. S/he made some fabulous, if odd, contributions to film soundtracks, a fact for which we should be atonally grateful. The other big sci-fi blockbuster of 1982 was ET. I like ET a lot, but if you contrast it with Tron it’s an exceedingly safe movie. The lustrous John Williams score, the sympathetic camera angles, the conventional narrative structure. Next to it Tron is a strange, awkward, angular film. No wonder there was tittering. And the science in Tron is utter gobbledygook. For a lot of the film’s duration you might just as well say “and then they done some magic” to explain what’s going on. But there are two important things about Tron. Firstly, it posited in popular culture (at about the same time William Gibson would have been consolidating the notion of cyberspace in his fiction) the idea that what we put into computers is of us, but no longer in us. It was an early intimation of the Internet, social networks, hacking and what we might loosely refer to as the information revolution. Secondly it neatly side-stepped the process of becoming dated. A lot of movie sci-fi, particularly the stuff dependent on special effects, becomes passé instantly as technology advances. There is a handful of works (which I think includes Metropolis, Things To Come, Forbidden Planet, 2001 and Blade Runner) that avoid this process by being completely sui generis. Their form and function is so completely contextualised as they are released that they never move forward in time with the rest of us. So Tron was not initially embraced, but it became increasingly admired and loved and now, 28 years later we have the sequel. In the original an impish Jeff Bridges played a computer programmer whose work was appropriated by a tech company whose “Master Control Programme” had reached sentience and was accumulating power. Hacking in to the system, in an attempt to prove that his work had been stolen, Bridges’ character enters the world behind the screen (best to hurry past this bit). Here he finds anthropomorphic versions of computer programs forced by the MCP to do battle if they are of no other use. Charmingly the programs have a mythology about the “users” who control their lives for some unknowable purpose. The olden days of 1982. Can it be that it was all so simple then? Long story short. Bridges’ character battles his way to the Input/Output tower returns to the “real” world with the proof he needs and becomes MD of the company. In the sequel, set in a version of now, Bridges’ character Flynn has been missing for some years (there is some great CGI with Bridges in flashback the way he would have looked in 1989, using his Against All Odds appearance as a reference I think). Flynn’s son Sam, having long given his father up for dead, finds himself in the same virtual world (there is some unconvincing talk of quantum teleportation, again don’t look, keep moving). However things have changed a lot since 1982, the threat is more acute and the stakes are higher. It is, I hope, not the stuff of spoilers, to reveal that Flynn senior has been in the virtual world all this time, now looking like the ancient and grizzled Jeff Bridges we love from Crazy Heart and Iron Man. Once reunited with his son, Flynn realises he has to do battle with his computerised alter ego Clu who is running the virtual world as a kind of Reich. This is one of the major similarities with Of Gods And Men, this interest in how a man of peace, whose moral way is not to fight, must behave when confronted with the unacceptable. A lesser film would sit back on its father/son dynamic and go for some Manichaean goodies versus baddies action. Not Tron Legacy though. As soon as the protagonists and antagonists are in place it moves straight to the theology of it. Flynn, effectively the creator of the Universe he is in, is tacitly acknowledged as God. Clu, his alter ego who is waging an ideological war with him, represents Lucifer. Flynn’s son Sam is Christ whose presence in the virtual world is shown to be instrumental in saving the artificial life that has evolved there (the analogue of humanity). Even with this structure though, the film-makers have not settled for the conventional Judeo-Christian interpretation of the ur-soap opera. In this version God accepts that Lucifer only behaves the way he does because that’s how God created him. The film’s climactic battle is not a fight so much as a struggle for God to get the Devil to forgive him. And through all of this, almost as an aside, the writers throw in with gleeful enthusiasm radical off-grid, Deepnet, dark Web ideas about life, evolution and the boundaries of identity. I just don’t think you get stuff like this in Pirates of the Caribbean. The look of Tron Legacy is amazing. The sheen and texture of the CGI is completely appropriate for its setting and, as I suggested earlier, the application of the 3D process is extremely intelligently done. The flashbacks are in 2D. There is a pre-credits warning telling you that they are supposed to look flat. Bridges’ performances are wonderful and bring to mind the highly lauded twin-acting that Jeremy Irons did in Dead Ringers. In place of Wendy Carlos’ eighties synthesiser-wonking we get Daft Punk. I was pre-indisposed to this. My mistake. It is beyond apt. Moving 'long the Queen's highway looking like a streak of lightning. In short, I loved it. As with two other big-budget films of last year Inception and The Social Network, I feel that Tron Legacy is far braver and more experimental than it is being given credit for. I will happily accept your criticisms of any of these movies, but I maintain that they are better than, say, the entirely predictable, lazily manipulative Toy Story 3. We got a better class of blockbuster than usual last year. Being a fan of the ’82 Tron, it wasn’t hard to thoroughly enjoy Legacy. But, due to a bowel malfunction I regrettably missed numerous parts. And on my birthday no less. So we’re off to see it again! First, let say how much I enjoy your writing! I’ve missed it while you’ve been on other journeys. Writing is not my forte, but I love words – especially reading and speaking them. Your style is intellectually stimulating and personal, and I have to admit I’m often frustrated that we can’t just meet for coffee and continue the discussion I’m having in my head with you in person. I very much want to see Of Gods and Men. I’m fascinated by questions of faith, belief, metaphysics, the religion-politics connection, ethics, cultural differences….Ooooo what a surprise, eh? Then I want to fly to Inverness and have that coffee.